Bellman Ford Algorithm to find shortest path | The Daily Programmer '+g+"
In our previous post, Dijkstra Algorithm, we calculated the shortest path from a single source to all destinations (vertices) on a graph with non-negative weights. In this post, we will study an algorithm for single source shortest path on a graph with negative weights but no negative cycles. 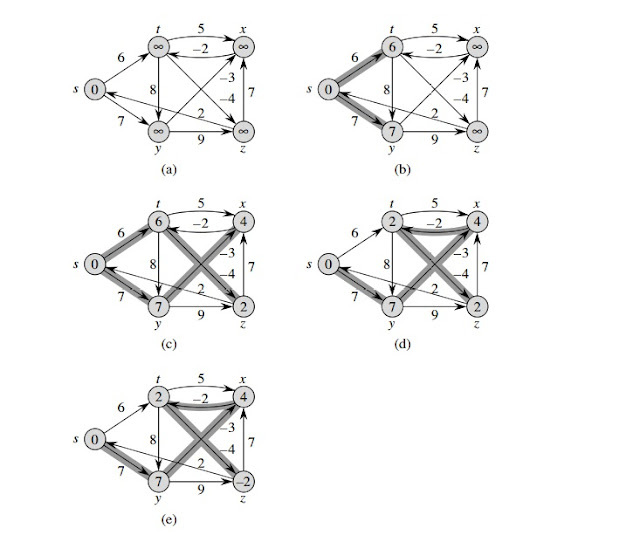 Breadth First Search : For graphs where the edge-weights are either zero or all same. Dijkstra's Alogrithm : For graphs where the edge-weights are non-negative. Uses greedy strategy. Bellman-Ford Algorithm : For graphs where the edge-weights may be negative, but no negative weight cycle exists. Uses dynamic programming. This post contains array - based implementation for simplicity. Another way is to use linked lists using dynamic allocation. The code in C is as follows. Its time complexity is O (VE). This is an awesome algorithm. 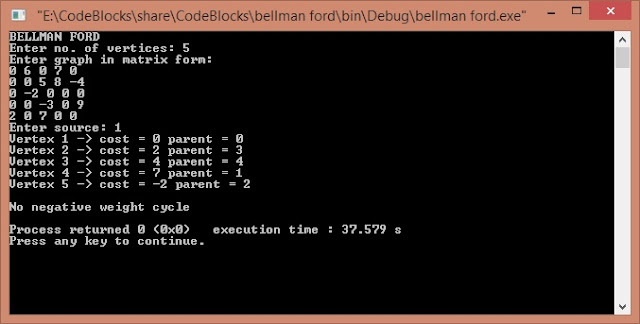 I also found another good and complete code for Bellman Ford Algorithm in C Programming. How you printed execution time in program? The execution time is not a part of the program, it is printed by default by the Codeblocks IDE. It is not required by the program, and is not indicative of the complexity as well. great but there is give the output as same for all of the given outout. how can solve it? can we print distance between source to other nodes even though there is a -ve cycle? Can you explain why k was incremented when the value of j is assigned to edge[k++]?